Output catches up to prior year; more growth ahead. 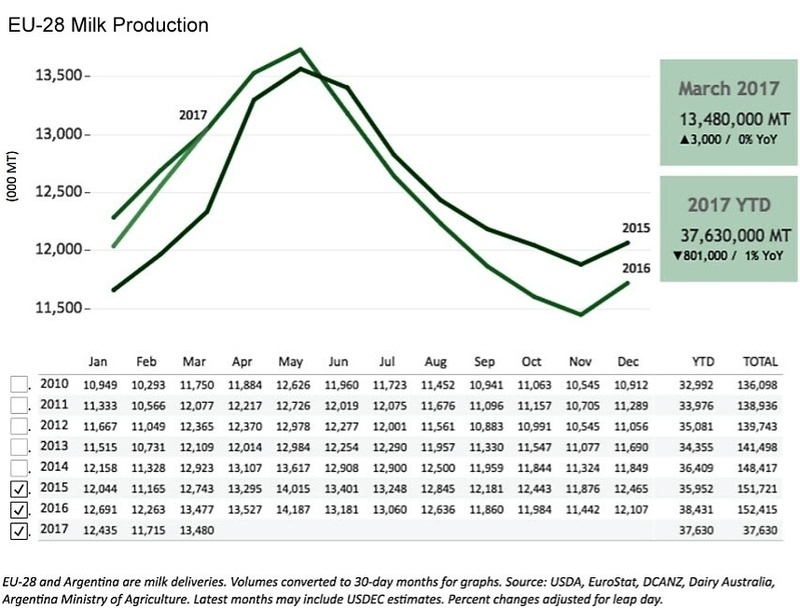 The year-over-year gap between monthly EU milk production has been narrowing since last October, facilitated by the recovery of European farmgate milk prices. In March, the bloc recorded its first increase in 10 months. While that gain—a mere 3,000 tons, technically a zero percent increase—barely exceeded the previous March, it is likely just a stopping point on the way to a bigger growth in the months ahead. Country-by-country results varied, but even those EU members still lagging the previous year showed significant improvement from January through March. The EU rebound is being led by Poland and Ireland, where first quarter output rose 3.5 percent and 1.1 percent, respectively. March deliveries jumped nearly 4 percent in Ireland and more than 5 percent in Poland. The two largest EU milk producers—Germany and France—remained in the red in March, with output down about 2 percent and 1 percent, respectively. (For the year, they are both about 4 percent back.) But that was due in large part not to market factors but wintry, wet weather that continued to plague the region through mid-May. Spain and Italy posted March gains, and the UK was quickly approaching breakeven. 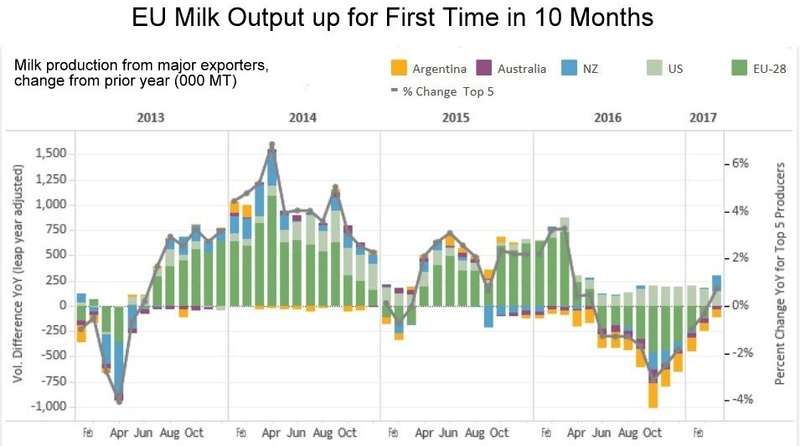 Even the Netherlands, a big contributor to overall EU milk gains the past two years, eked out a bump in March deliveries, despite moves to start implementing a phosphate reduction mandate that includes a significant dairy cow cull. Early reports suggest further mixed results for April, with the Netherlands down slightly, France and Germany likely to continue to lag, and Ireland, Poland and Belgium on track for record peak production. With weather improving and farmgate milk price projections expected to stay at or near current profitable levels, milk deliveries are likely to continue to recover vs. the previous year, particularly given more favorable 2016 comparables ahead. We are, in fact, more bullish on EU milk production than current European Commission forecasts of a 0.6 percent increase for the year. We look for better than 2 percent growth in the second half—a year-over-year increase of nearly 300,000 tons of milk per month—bringing the 2017 total to a 1 percent gain. Expect European exporters to remain aggressive to move this growing supply. Editor's note: This analysis is based on data available on May 23.